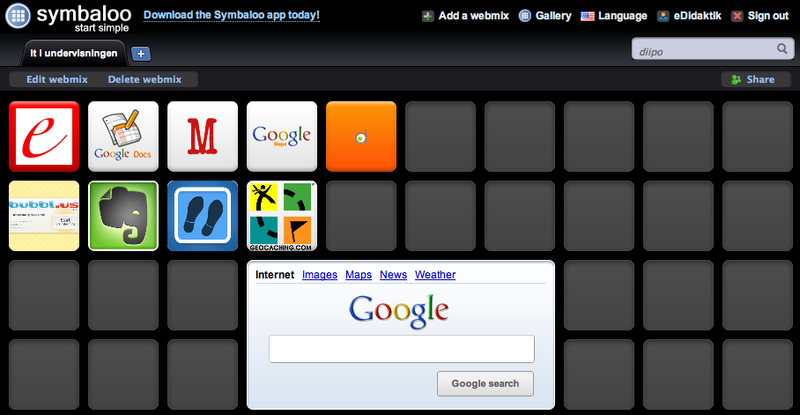 Symbaloo is a visually based tool for managing and sharing links to websites and online resources. It gives the teacher the opportunity to curate collections of relevant links for students. The tool is suitable for use within a monological form of teaching. In the monologic form of teaching, Symbaloo can act as a teacher's collection of links for students. It might be a good idea with a common link collection when, students are to seek information about a particular topic. By bringing together the most significant sites and resources on the topic in one place, the teacher can ensure, that students have a common ground to work from – regardless of their ability to search information on the Web. In this manner, Symbaloo may serve as a tool for filtering and curating the flow of information to the students.